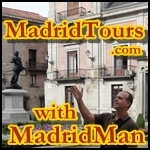 (NOTE: read MadridMan’s 2009 Blog Entry on Spain’s Christmas Lottery)It’s time once again for “El Gordo“, Spain’s Christmas Lottery! Just yesterday, Saturday, about 30 minutes before the lottery offices closed, I ran out to my local lottery ticket office to buy FIVE “décimos“, which is a ticket worth one-tenth of one entire ticket series. One complete series, which is 10 tickets all carrying the same number, costs 200 Euros. So one ticket costs 20 Euros. I bought 5 tickets all ending with different numbers. 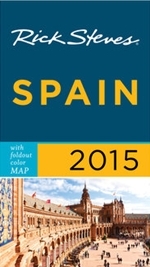 See last year’s entry, “Spain’s Christmas Lottery“, with photos and more information. I was nervous approaching the lottery ticket office, half expecting a long line out the door and down the street. Luckily, it was nearly empty and only waited maybe 1 minute. Whoo! Mind you, this is a small lottery ticket office outside of the downtown. 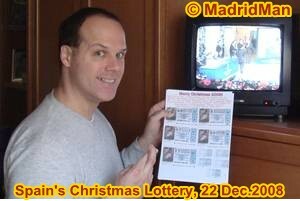 Those lines mentioned in last year’s “Spain’s Christmas Lottery” blog entry continue this year. I don’t know why people would voluntarily wait in line so long but I guess they have superstitions about one lottery office being luckier than others. The 5 tickets were “gifted” to 4 good friends as my Christmas gift to them. I scanned all the tickets, front and back, and added a holiday message to it. On the resulting graphic I included the 5 names (including mine), stating that if one or more tickets won that we would all 5 share in the winnings. Then I attached the graphic to an email and sent it to the 4 friends. I thought that was a good idea. Maybe people would’ve preferred a bottle of cologne. This year’s drawing is on Monday morning, 22 December. You can be sure I’ll be awake early to watch “the big ball” tumbling around thousands of tiny, numbered, wooden balls. As the galls come out, nicely-dresses young school children sing out their numbers as they carry them over to the inspector, seated at the edge of the stage. The televised event is carried by most channels and is really very entertaining to watch. Hopeful lottery ticket holders attend the Madrid-based event and many are interviewed, often wearing wild outfits to give them luck. People on the street are interviewed too, holding their tickets and telling what they’d do with their winnings. And then, of course, there are the interviews of the winners around Spain, small groups of people standing in the streets, dancing and singing and spraying champagne victoriously, telling what they’ll do with their new found fortunes. It’s fun to watch but is all over by noon. And the rest of us go back to our daily lives. So wish us luck! And I wish you luck if you have a ticket in this year’s “El Gordo”. But even if you don’t win, MadridMan hopes you have a very very Merry Christmas (on December 25th) and Reyes Magos (on January 6th), and, of course, a very positive year ahead. Economic crisis or not, we have much control over our own happiness. UPDATE: 9:30am Monday morning of the Christmas lottery drawing, see MadridMan at right holding copies of his hopeful lottery tickets, crossing his fingers, and watching the Lotería de Navidad de España on the bedroom television. Nevermind the “bed head”. UPDATE: 3:15pm Monday afternoon, I’ve looked up all my/our numbers and none of them won. 2 of the 5 tickets did fall within 1 or 2 final digits which would have won 200 Euros though – so not close enough. One ticket was within 3 final digits which would been good for 1,000 Euros. 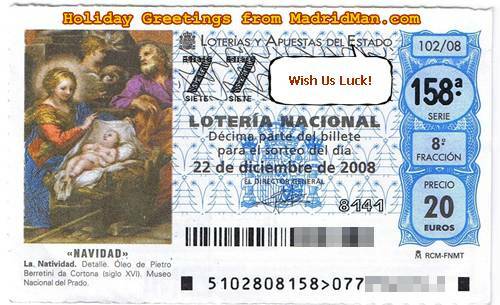 This entry was posted in About Spain, Money and tagged 2008, Christmas Lottery, décima, décimo, España, Loteria Nacional, Lottery, lottery ticket, Spain, ticket. Bookmark the permalink.